helps students know what they know and what they don’t know to become more efficient and effective learners. 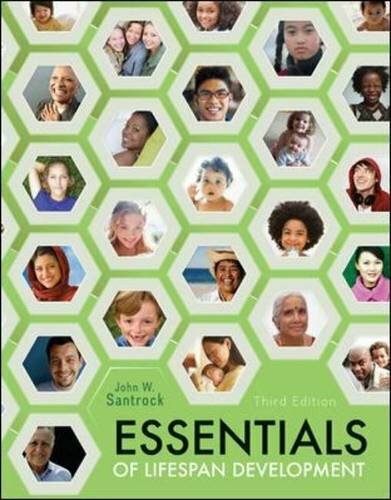 Organized in a concise format, Santrock Essentials helps students relate to the material and study more efficiently by driving them to the applicable reading content in a format that is more student-friendly.Based on hallmark features- its expert contributors, updated research and focus on applications, Santrock provides the most dependable and current presentation of lifespan development available, and he does so in a briefer format and with our adaptive diagnostic helping to ensure that your students will read and appreciate the material while seeing the applications to their everyday life. In Santrock, our newMilestonesvideo and assessment program helps bring the course material to life, so your students can witness development as it unfolds.Essentials of Lifespan Development 2e, was carefully designed and constructed to deliver these core concepts along with a strong applications focus reflecting the broad range of interests and backgrounds of students taking this course. And as always with John Santrock’s texts, the latest research in the field is incorporated throughout. from divorced families. He has been a member of the editorial boards of Developmental Psychology and Child Development. His publications include these exceptional McGraw-Hill texts: Child Development, 13th Ed; Life-Span Development, 14th Edition; Adolescence, 14th Edition; Psychology, 7th Edition; and Educational Psychology, 4th Edition.